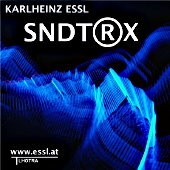 Karlheinz Essl’s free online album SNDT®X is one of the more exciting releases in the electronic/electro-acoustic field that I’ve heard in a long time. Surprisingly easy to listen to yet avant-garde, it is a primer on experimental electronic music complete with drones, found sounds, sampling and much more. The title alludes to the cinematic texture of this sound art. Most of these tracks were created to accompany a film, performance, or art piece. The opening track, Father Earth is a pulsing mix of guitar and electronics reminding me of a subway or train station. I am also reminded of Glenn Branca’s minimalist walls of guitars at some points. The 13 minute Action Rituelle combines computers and religious chants into an intensely spiritual experience. As mentioned before, some works such as Carl Mayer Scenar(t)ist and Balkonszene are soundtracks meant for films or art performances. While most of these pieces are droning or minimalist, PENDENTE stands out for its melodic beauty. Sonnez la Cloche! is based on the sound of a bell while Decontructing Mozart does exactly that, pulling apart the composer's music into a post-modern nightmare. The tracks go on, each one giving new insighst to the state of organized sound. This is an excellent example of the experimental and avant-garde and much more accessible than the novice might think at first listen. Give it a few tries. It will grow on you. I first encountered the work of Karlheinz Essl at a Jonathan Meese exhibition in Vienna. Essl had composed a soundtrack for the exhibition which I found to be at once complimentary to the work of this very great artist while remaining wholly autonomous. I have had an interest in soundtracks for exhibitions for many years but usually the music is weak. It can be the songs of a friend or something cobbled together by the artist like a set of wobbly home spun basement tapes. But this was truly amazing. Just to be able to hold your own in a Meese exhibition is one thing but to stand out is something much more impressive. What I took away from this exhibition more than any other thing was a wish to know more about the music of Karlheinz Essl and in my quest since then to listen to as much of it as possible my interest has only increased exponentially. Essl's work is discursive while at the same time it represent a viable idea for extending the experimental music project outwards from minimalism and electronic noise work toward something that exists as a composition which presents its own set of footnotes at the same time. His 2008 release SNDT®X never ceases to excite and the tracks Deconstructing Mozart und GRIDS are continual revelations.